Playback of a 16 inch acetate transcription disk. Most of us are aware of the requirements for playing modern stereo Lp's--a good turntable in good condition, with a phono cartridge, properly installed and adjusted. A phono preamp is also required, as the output of the cartridge is quite low (almost microphone level) and needs equalization to compensate for the bass cut and treble boost with which analog records are recorded. As I said, most of us know that. 1. Speed. The modern Lp is almost always 33 and 1/3rd rpm. (A few 45 rpm 12 inchers have been made by audiophile labels.) The modern 7 inch single is always 45 rpm. The official standard for vintage electrical-era disks (post 1925, approximately) is 78.26 rpm. Earlier disks varied quite a bit, from 71.29 rpm for early Berliner and acoustic Victor recordings to 90 rpm and above for some Pathe disks. Broadcast transcriptions are often recorded at 33 and 1/3 rpm, though some will be at 78.26 rpm. Finding the correct speed for a particular disk is often a matter of research, combined with some educated guessing. (If you know Caruso sang "Ombra Mai Fu" in G, you will know that reproduction of that recording in A flat must be a semi-tone sharp.) And with some old disks, the speed can actually vary in the course of a side, going from, say, 78.26 rpm in the outer grooves to about 76 rpm near the label. Old time cutting lathes were not always stable or accurate. 2. Groove width. The modern Lp has grooves that are nominally 1 mil (1 thousandth of an inch) wide. [I say nominally because the specification refers to the measured width about half way down the walls of the V-shaped groove, typically the contact points for the stylus as it rides in the groove.] Electrical era 78 grooves are 3 mils wide. Earlier disks can have grooves even wider (4 to 5 mils), and one-off transcription disks can vary between 2 to 4 mils. Radio transcriptions will usually have 2 mil grooves if they are laterally cut, but many vertically cut transcription discs from the 1930s have 2.5 mil grooves. If you try playing wide grooves with a stylus meant for the Lp standard, the stylus will ride along the bottom of the groove, which will add lots of noise to the signal. Further, old records can be worn from being played on heavy-tracking old record players. Picking a stylus size that rides above or below the main wear track on the groove walls can improve the sound considerably. A.	Bass waveforms are large and can take up lots of room on a disk. In the acoustic era this was not a problem, as the primitive recording horns could not capture enough low frequency energy to inscribe it onto the disk in the first place. But with the introduction of microphones and electrical cutter heads, that all changed. Now lots of bass could be recorded, making it easy to run out of disk space very quickly. The solution was to roll off the bass response during recording and get it back on playback with a complementary bass boost. Early electrical 78's used a rather gentle bass boost with a corner frequency of 250 to 300 Hz. As time went on, more aggressive curves were tried, some even exceeding the modern RIAA bass turnover. Finding which of the available bass curves should be used for a particular pre-1954 disk can involve some research and, sometimes, some critical listening as well. B.	Treble. Again, early acoustic disks used no equalization in the high end, which is one reason why they tend to have lots of surface noise. Early electrical 78's did not use treble EQ either and, theoretically, should be played back with no treble rolloff. It was only a matter of time until boosting treble during recording and cutting it during playback was tried for reasons of noise reduction. Starting in the late 1930's, treble rolloff of -5 dB (at 10 kHz relative to 1 kHz) and -10 dB became common. After World War II, even more aggressive curves were tried, culminating in the NAB treble rolloff, used for some broadcast transcriptions and for the first Columbia Lp disks. The RIAA treble rolloff finally adopted in 1954 could be described as -13.7 dB at 10 kHz, actually a step back from the more aggressive NAB curve. 4. Disk size. We are used to 12 inch diameter Lp's, 10 inch Lp's (common in the 1950's, seldom seen now) and 7 inch 45 rpm singles. In the electrical 78 era, most commercial releases were either 12 inch or 10 inch diameter. Acoustic era disks, as you might expect, varied a good deal; while the 10 inch disc was probably the most common, there were other diameters, including oversize discs of 14 inches or so. And disc thickness varied as well; Edison Diamond Disks are nearly 1/4 inch thick, several times the thickness of most other disks. Put one of those on your turntable and you had better be able to adjust the height of your tonearm. Then there are broadcast transcriptions, a category unto themselves. Due to the need for extended playing time when broadcasting, those discs can be up to 16 inches in diameter or even larger. 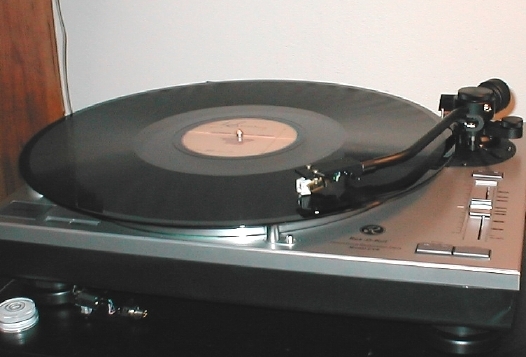 Most modern consumer record players cannot accommodate them; the arm pivot is usually too close to the turntable to clear a 16 incher. 5. Groove modulation. We usually think of record grooves as moving laterally, that is, from side to side on the disk surface. Stereo records, of course, also use some vertical modulation in order to give us two channels from one groove. Most vintage disks use lateral modulation exclusively, which translates to a monophonic signal when played with a modern, stereo cartridge. Summing both channels to mono gives you all of the music, with some reduction in surface noise. However, some vintage disks, in particular those made by Edison and Pathe, use vertical modulation exclusively; the groove moves up and down, not side to side. There are also broadcast transcriptions that use vertical modulation, especially those made with Western Electric recorders in the 1930's. Played with a stereo cartridge, such records will sound rather weird in stereo and when summed to mono--the sound will disappear! To play these records with a modern cartridge, it is necessary to first wire one channel out of polarity and then sum both channels to mono. Only then will the result be equivalent to mono playback of a lateral cut record. Finally, it helps to have a good computer-based digital audio recording system with specialized restoration software for preserving and, we hope, improving the sound of our transcriptions. Many people, when confronted with the task of playing back an old 16 inch transcription disk, will attempt to do so with any old turtable that will accept a disk of that size, with a phono cartridge fitted with a generic "78" stylus and a phono pre-amp with RIAA (that is, modern LP) equalization. Their reasoning goes--and I have actually had this said to my face--"there's so much rumble and noise with those old discs anyway, it doesn't make much difference." This attitude is simply wrong. Radio transcription disks, at their best, are capable of genuine high-fidelity sound and the quality and appropriateness of the playback equipment make a very audible difference. This should not surprise, as the format was originally developed for use in professional broadcast installations, with the objective of providing recorded material that, from the listener's point of view, would be virtually indistinguishable from a live broadcast of that time. As the MP3 files below will show, that objective was achievable, provided proper playback procedures were used. Both of the following examples are from a lateral cut, acetate disk dating from the mid-1950's--in fact, the same disk seen in the photo at the top of this page. (Transcription disks continued to be used at radio stations well into the 1950's, until they were eventually replaced by tape.) The program is a live concert, hosted by an announcer. Each excerpt starts with a few sentences from the announcer, followed by a segment of music, the ending of George Gershwin's "An American in Paris". In the first example, playback was done with a typical "78" stylus (in this case, the 2.7 mil stylus Stanton makes for their 500 series phono cartridge) and RIAA equalization. This is a mono MP3 file, size just over 1 MB. In the second example, playback was accomplished with a custom 2 mil stylus (also used with the Stanton 500 phono cartridge) and with NAB equalization, all other conditions being the same as in the first example. This is also a mono MP3 file, size just over 1 MB. I will tell you in advance that on any decent playback equipment you will have no trouble telling the two files apart--the difference in noise and distortion is that obvious.